Christmas comes but once a year, but when it comes it brings good cheer. The holiday season is brilliantly celebrated with holiday galas for adults and pint-size kid parties. Holiday tiding and tradition are sprinkled about every home. Did you know that a child’s countdown to Christmas starts on Christmas Eve, not Black Friday? Upon the eve of Christmas, every child’s wonder and merriment leads to a tuck-in of cherry plum dreams. Will Dasher, Dancer, Prancer, Vixen, Comet, Cupid, Donder, Blitzen arrive at their home and leave the stockings filled? Leave out milk and cookies for Santa and add this magic reindeer food recipe to your holiday repertoire. 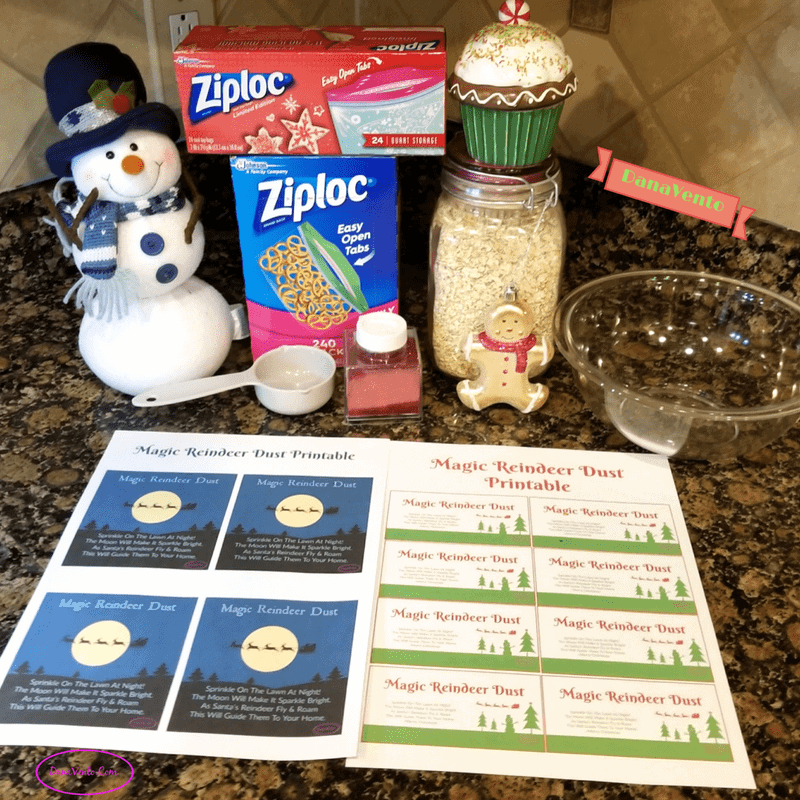 Greet the most anticipation-filled night for children everywhere with this magic reindeer food recipe and a printable treat bag topper. Help guide Santa’s sleigh and reindeer to your home, delivering a new holiday tradition your children will cherish year after year. Lavishly live the beauty and wonder of the holiday season out loud. The night before Christmas is the happiest night for kids, as tidings of the season bless their sleep and waking time christens their lives with new treats. Happiness and all the trimming happen in a Christmas Eve house only if Santa can magically appear and fill those stockings. 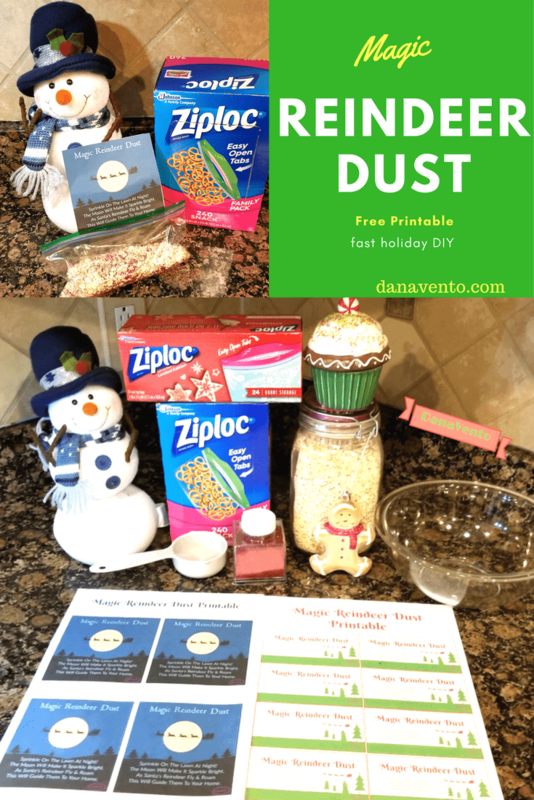 Since the reason for the season is about to happen, make it easier for yourself by creating Magical Reindeer Food that the children spread outdoors. The recipe includes a ‘glistening’ ingredients to help reindeer find their way from the twinkle on the ground. Your hustle and bustle of this most festive season help you ‘zip’ the delivery system of stockings filled with care with ease. Your secret to success in magic reindeer food is all in the creative “use as imagined” filled ZIPLOC® Brand Snack Bags. Each child receives a ZIPLOC® Brand Snack Bag filled with the magical feed and they get to scatter it all over outside. Once the kids scatter the magic reindeer food they have guaranteed the way for Santa and his reindeers to find your home. The path of glistening is the path to getting the kids to sleep and believe. Who knows you might even spread the magic fast enough to catch a good night’s sleep yourself. Choose what Magic Reindeer Poem you are using from below or use both. Print and cut for use in and on Snack Bags or Holiday Print Quart size. If you have used the printable for the Magic Reindeer Poem (business card size- *Alternate printable below) place it inside the bag. or in the Snack Bag this is truly all preference. The ‘Easy Open Tabs’ are the gift you need to make this project perfect. The ‘easy open tabs’ are perfect for stapling the Topper to one side only, and easily allowing access to the bag without destroying topper! and the Holiday Print Quart sizes are great too, so festive. Fasten the topper to the ‘easy open tab’ and then fill with the mixture below. Use a 1/4 scoop of mix per Snack Bag repeating until you have filled 8 bags. The mixture makes 8 bags. Close the Snack Bag shut. Place in holiday basket and hand out to each child for Christmas Eve Night. Use cardstock paper to make a firm printable. Staple ONLY to ‘easy open tab’ of Snack Bag or Holiday Quart Size Bag so that the bags open without removing the tag. You can place these in the bag instead of topping the bag, another great option. Of course, you could always do both! This is a cute idea. I think its good to give reindeer food, I am sure Santa isnt the only one hungry lol. Oh my goodness – this is such a cute idea for the holidays! I bet our kids would love to make this Reindeer Mix! This is such a lovely idea to do for Christmas! I think we pay too much attention to Santa and forget about his reindeers! This treat would be fun to make with the children. This stuff is way too cute! I remember when my kids made this in kindergarten and were so excited! Thanks for the printables. I think I will make some of these magic reindeer dust for my grandchildren to sprinkle on the lawn. I am pretty sure they will try and stay awake waiting for Santa’s reindeer to come. This is such a neat idea. One more reason Ziploc is the best! My mom always made these when I was a kid. This is a super unique version of it though; I really like it! I had never heard of this until this year, and I think it is such a fun idea! My son will be thrilled to make this for Santa’s Reindeer. How fun! I loved making reindeer food when my son was younger. One of my favorite traditions. Your printables are so cute. Reindeers definitely deserve a little treat when they come by our house at night and this is perfect! I would love to make this with my daughter, I’m sure she’s going to be super excited about it! This is so cute. We have always made reindeer food like this but never knew the poem. So darling! I love this special season, and all of the moments we can spend together as a family. Making reindeer food is going to be a great addition. Now this is an awesome sounding idea, I might just make some of this for the neighbours granddaughter as I know she is coming around this weekend and he is going away for Christmas so might be a bit of fun for them to use. So easy, so fun, enjoy your time with your granddaughter. How cute! What a fun way to further enhance the night before Christmas experience. My kids would love this! People do not talk about this nearly enough! I hope Santa remembers to bring this food up to the reindeer! So long to giving the reindeer carrots this year! We”’ be making this reindeer food! Your toppers are awesome! I love this recipe! We make treats for Santa AND his reindeer every year. Why should the Jolly Old Elf be the only one who gets a treat? My kids are a little past the waiting for Santa stage but this is so much fun for the little ones to set out for the reindeer. I will show this to all my family with the younger kids who wait for Santa and the reindeer. Our kids always leave snacks for Santa and treats for the reindeer. They’ll be excited to make this reindeer food this year. I love the treat bag topper! So festive! I love this idea! I work in marketing and organize a lot of events, I would definitely implement this during a Christmas themed party. Magic reindeer dust is our new tradition. This is fantastic as it will foster and bolster the holiday spirit. Thank you for sharing. This sounds like a lot of fun, especially for children. I don’t have children but I will remember this. This is such a great idea and practical too. Just in time for the holiday season and even kids would love to do it. Thank you for the coupons. This adds to the many uses of the Ziplock. I will check this out. This is such a cute idea, Easter we planted jelly beans and the grew into lollipops. We are always looking for new traditions to pass along and I can see this one becoming a favorite for the household. so glad to hear this. thanks for reading. This such timely and awesome ideas. I love the idea of ZipLoc and printable, so cute. My kids would love this. Ziplocs are so useful and the printable is so cute for this recipe. Ah this is such a beautiful idea, I bet children will love this tradition at Christmas, anything that encourages the magic of Christmas I am all for!! Wow this sounds nice!! I have decided that I will make this and give all my neighbourhood children as they will love this ? Thanks for sharing this lovely idea? I love DIYs especially the ones to do with the holidays. Will definitely try this one out. Lovely post! What a way to build and encourage the Christmas spirit. I don’t have kids yet but this I will try when the time comes. This is awesome! It is timely for the holiday season and even kids can easily do this. This adds to the many uses of the Ziplock. This can be a good treat, giveaways or even a small business this Christmas. It’s a wonderful idea. Thank you! I saw the same thing, I thought this was food but a Zip lock ha ha. This made me hungry though. Weird name for a food. I will give it that. This is timing for the holidays. Thanks for sharing. Thanks for this lovely article! As I was reading the whole thing, it brought a smile to my face. Once I get home, I’ll this with my family! I am so glad you smiled:) I do when I prepare this and I also get the kids texts from Santa. ” delivering a new holiday tradition your children will cherish year after year” What I think that, if you can tell something special to your kids, they might more understandable different cultural. Yes and they can Text Santa Too Take a Look. This is practical and cute! PLACE IN HOLIDAY BASKET AND HAND OUT TO EACH CHILD FOR CHRISTMAS EVE NIGHT – surely the children will be thrilled. The kids love tossing this outside for the reindeer and they love their texts from Santa too! Wow Christmas is already here soon, and I’m here thinking it’s still mid year. Going to apply for 2 weeks leave this time, gonna go full yolo! Great to hear and enjoy! Tryout this recipe to summon the reindeer! I don’t celebrate Thanksgiving or Christmas, but I really do wish I did after seeing posts such as this. This is something that I would love to try out one day, when I am celebrating it too. Ah I love this!What a great activity with the kids to make Christmas even more magical! IT is perfect to call on the reindeer and imagination and Santa can text them too. Reindeer need the glitter to glisten against the moonlight and of course the glitter falls to the grass, while the oat remains atop for them to snack on. This snack is NOT for humans only reindeer. Yummy. Ooh i love christmas, thanks a lot for the recipes, at least this time round i have something different to prepare and wow my family with. I can imagine the smiles on the kids faces once they receive the Ziploc brand bags, they will be so happy. Personally I would love to see the glowing of the magic Reindeer dust under the moonlight. IT is cool to see the light reflect against the magic reindeer food, the glistening. Amazing idea I sure would love to try this out. The problem is I can’t access the products as Walmart is not anywhere close to where I leave. Will try out this stuff this coming Christmas, it’s so near. Looks amazing for the kids and am sure they will love it. Its true Christmas comes with all sort of goodies. I appreciate for the recipe and admit its pretty cool. This is quite interesting DIY to do this season. I agree on you, Ziploc® Brand products are amazing! Ziploc® Brand bags cannot be only used as candy crusher or as a cookie dough savior; I also used it in organizing stuff in the kitchen. Thanks for the digital coupon and also for the templates and printables! Cheers! Great recipe for Thanksgiving. It looks so tasty and sparkling, glittering. This is a good gift idea for my relatives. I want to try it. Wow! This is unique. Since I’m not really from the US all we really get excited about before was Santa and the Santa Socks. I think this artistic craft of using oats and glitters for raindear food will pick up our child’s Christmas mood even more. This will definitely make kids go crazy and excited! Although I doubt that the kids will get a goodnight sleep after they sprinkle the Magic Reindeer Dust. They will surely wait for Santa! The illustrations on this are lovely, I think I’ll use mine inside as I’d be worried about birds eating the gliiter – perfect to pop in a pot by the chimney! I think making your own is such a great idea as its so simple to do too. I love the cute printables you have made. What a magical idea! I wish I was still young enough to believe in Santa Claus haha! A friend of mine volunteers with a Rainbow Girl Guide group and I am sure that this activity would go down a storm with them, I’ll be forwarding your post to her! Abbey Louisa Rose ( recently posted..What will you give this Christmas?